This Report contains the results of our audits of financial reports of entities in the local government sector, comprising the 29 councils, three subsidiaries and eight other local government entities. It does not include entities where the audit was dispensed. Refer to Volume 4 – Audit Summary 2017-18 of this Report for further details regarding dispensation. Councils were created under the Local Government Act 1993 (LG Act) and provided governance, planning, service delivery, community development, asset management and local regulation to their regional areas. In some cases, councils established subsidiary or other entities as required to assist them achieve their objectives. Three subsidiary entities were separately audited in 2017-18. 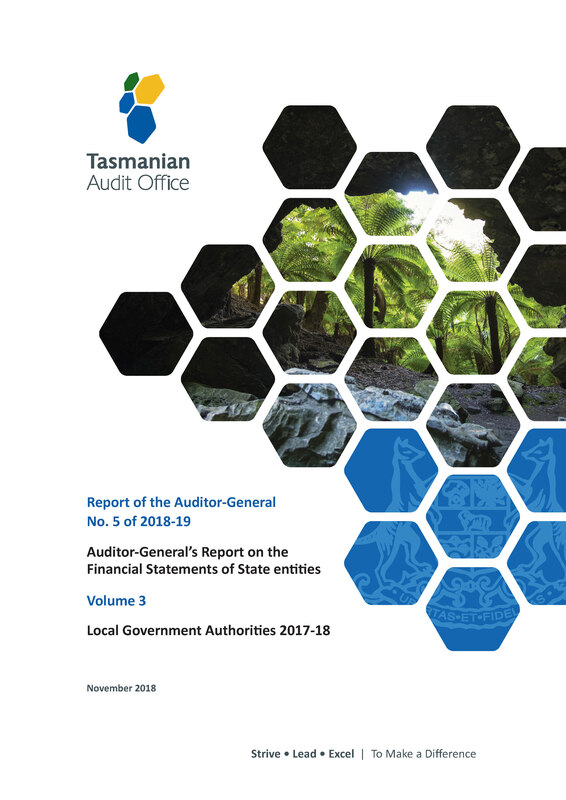 Other local government entities were single, joint or controlling authorities controlled by councils and established under the LG Act, including a fully owned subsidiary of a joint authority, Local Government Association of Tasmania (LGAT) and Northern Tasmania Development Corporation Ltd.
All entities had a 30 June year end. The reporting framework for these entities was generally prescribed by enabling legislation or rules. For the LGAT, Launceston Flood Authority and C-Cell Pty Ltd as Trustee for C-Cell Unit Trust, we accepted preparation of a special purpose financial report. All other entities prepared general purpose financial reports. Chapters are included for each of the 10 urban councils. The remaining 19 rural councils have been included and analysed in a summary Chapter. For 2017-18, each chapter includes some infographics that provide a snapshot of key data or statistical information applicable to the entity.